We teach key academic competences to enhance researcher’s performance at universities and institutes. Learn with us how to increase efficiency and quality in your academic work, projects and communication! Let us help you to publish, present, supervise, complete a PhD or get a job in academia. Plan & Manage My PhD! Get a Job in Academia! For over a decade, we have advised people like you – researchers, PhD students and academic leaders. Face-to-face and online, we instruct you how to maximise your personal potential and lead you to achieve extraordinary results. We help researchers worldwide, from all fields of research, while receiving top marks from our participants. We strongly believe that good academic performance is the result of systematically applying know-how to research, projects, and teaching. However, you do not need to start from scratch and without advice. You can capitalise on our long-standing expertise and experience to show you the short-cuts to success. Our advisors and instructors all share academic backgrounds, and love to show you how to achieve your greatest academic potential. 10+ years in the business of helping academics succeed! Five years ago, the University of Basel developed the antelope career program, which aims to assist highly qualified female junior researchers. To date, we have supported over 220 participants in their careers through funding, training, and coaching activities. Choosing competent trainers and coaches is particularly important for our program because they bring their expertise, their advice and their wealth of experience to prepare the scientists for their future careers. TRESS ACADEMIC was a very important partner for us from the beginning. Not only are they professional and communicative, but they are also always willing to find individual solutions. This has made our cooperation very effective, uncomplicated and extremely pleasant. Bärbel and Gunther Tress have become an integral part of the antelope family. The TRESS ACADEMIC training courses, “How to apply for an academic job”, professionally guides our postdoctoral researchers on their way to professorships. We are proud that many of them have already moved beyond the application process and now hold professorship positions. With the other training courses, such as “How to publish in peer-reviewed journals”, “How to present at international conferences” or “How to become a more efficient researcher”, TRESS ACADEMIC has also provided the participants with important knowledge and has significantly optimised their output. The Alfred Wegener Institute for Polar and Marine Research (AWI) is a research institute that operates in remote areas where support-lines are absent. We expect our early-career researchers to deal with unforeseen situations, cope with challenges and solve problems in a creative way. To a certain extent, we expect this attitude also from our trainers. We require not only a perfect curriculum that guarantees training success, but also a willingness and ability to deal with heterogeneous groups, strong individual characters, institutional constraints and the very special atmosphere every research institution has. Did you know that the majority of PhD students go way over time with their project? As a PhD student, have you ever wondered what the reasons for that may be or pondered what the consequences are for your future career? 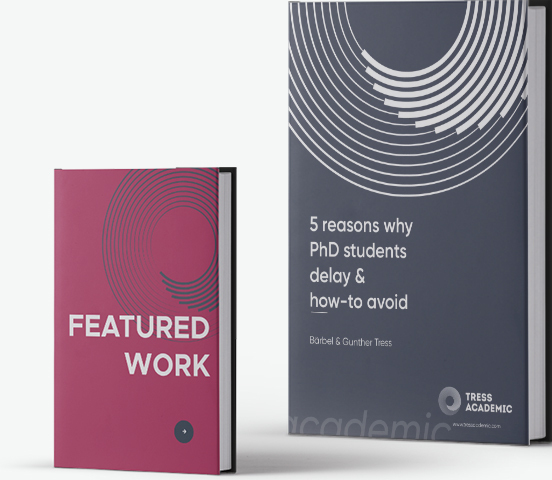 We taught several thousand PhD students over the last decade and from their experiences we have distilled the most common reasons why PhD students delay. But we did not stop there, we developed strategies that will help you avoid a delay in your PhD study. Download our FREE EXPERT GUIDE in which we give you tips what to do to get your PhD project on the right track so you can complete on time.